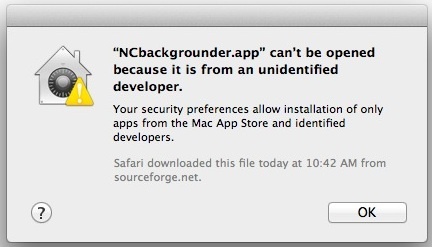 Mac OS X defaults to preventing applications from unidentified developers or sources from being launched. 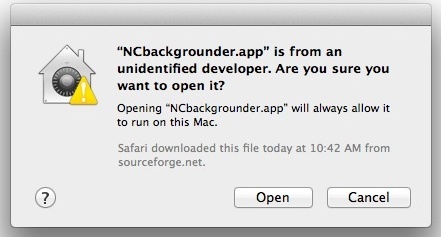 You’ll discover the message in OS X when you try to launch a Mac app that didn’t come from a verified source or from the Mac App Store, and you’ll get an alert dialog that says “[App name] can’t be opened because it is from an unidentified developer”. This is the same in all versions of OS X with Gatekeeper support, including OS X Yosemite 10.10.x, OS X Mavericks, 10.9.x, and Mountain Lion 10.8.x, where the feature was first introduced. This kind of “security” is stupid and is not really security at all. At best it is a tiresome annoyance. I really hate the MS method of blocking files downloaded until I purposely unblock them. It is a pity that Apple has adopted the same boneheaded approach. If I downloaded the app or file I very well intend to use it. A warning the first time the file is opened is fine, after that it is simply gratuitous aggravation. Apple’s Gatekeeper only shows you the message the first time. And while you may certainly want to open a file that you purposely downloaded. However, if a malignant website downloaded a file (i.e. Malware) without your knowledge wouldn’t you like to know about it rather than have it silently install itself??? I am an aerospace engineer. I am technically ept. It makes me very, very angry when I cannot work on my computer because of restrictions that help keep idiots safe. Well aren’t you special, mr. aerospace guy. Not all Mac users are as technically brilliant as you clearly are, so Apple needs to appeal to the masses. Don’t like it? Use Linux, so you can look down your nose at most all other people sitting in front of a keyboard. I’ve been a systems admin for over 15 years. I used to work at an aerospace firm. I left as soon as I could since every user there (yes, you are just users) thought they could do every job in Info Systems, even though they were clueless when it came to the most basic of networking/computing protocols. During the time I was there I never tried to build an aircraft. Just because you know a few keyboard shortcuts doesn’t mean you know jack about computing fundamentals. Know your role, snob. You give Mac users a bad name. He’s not a Mac user, he’s a wannabe n00b who thinks he’s something special because he has the word “engineer” in his title. It’s all good though, my 2-year-old cousin is a thumb-sucking-engineer, so he’s pretty “technically ept” as well. Oh by the way as good as you think you are, Your sites down. No, he’s not special. I’m an electrical engineer, and it is irritating to have to fight the software. The correct way to handle this is to indicate that you are running a program that isn’t trusted, explain why it’s not trusted, and ultimately allow you to over-ride it directly from the pop up menu either temporarily, or permanently, for that program. Not force you to go to a website and look up a method of enable the program. But I understand why they do this. Apple is making money off from every program that is “certified” by them. They intentionally broke the interface, and made it possible to run a non certified program, but only through a great deal of difficulty, to try to make money off from developers to get their software certified. Well, it just means I’m done with my evaluation of the Mac on VirtualBox, and I’m discarding it, and going to continue with Linux. I really am surprised that this vile system is considered a competitor to Linux or even FreeBSD. It’s like working with a really crippled Unix system. 1. Non-technical users should generally not be referred to as “idiots.” They might not be as computer savvy or be able to do aerospace engineering, but they probably have other skills that you don’t, which would make you the idiot from their perspective. 2. Just because you know something about aerospace engineering doesn’t mean you really know anything about computer security. As an IT professional in the field for nearly 30 years, I find that self-proclaimed user experts usually really aren’t as great as they think. 3. If you’re so smart, why don’t you just disable this feature so you don’t have to deal with it? And if it is so easily disabled, then why does it bother you so much? 4. This is probably the safest way for a computer manufacturer to configure this capability. Somebody who is computer savvy will quickly identify what they need to do to circumvent this system, even if it means searching the internet and finding a thread like this. Non-technical users have the safest setting for their level of expertise. > great as they think. Funny … I’d say the same thing about IT professionals. As a DevOps for 150years, I think everyone should do whatever the hell they want. If you want to buy a product that is obviously popular and then complain about its features.. then Kudos on you and your well earn money and time. I stick with Windows and their intel chip and cntr-alt-del the crap out of every situation. Disable all the scanners and firewalls, because, let’s face it, it is annoying to click ‘OK’. Wait….what did I buy and what am I complaining about again..
Oh well, at this age I am losing the plot!! This type of security is NOT so that ‘dumb’ users won’t hurt themselves – this prevents malicious developers from distributing apps and passing them as “legit” or harmless apps. Code signing and all of that are hoops that one needs to jump through to be a “secure” app and make it that much harder for a malicious developer to have free reign over the OS. Well, if I fix that one, who will fix the rest? I don’t think is a good idea to disable when you can easily add the exception with Ctrl+Clic. I think that most people would rather not have it at all. Unfortunately, this is yet another attack on those who distribute free software. In essence, Apple is requiring anyone who wants to do so to pay to become a member of their Developer club. If you are selling software, you can adjust the price to reflect this tax. If you are distributing free software, you are being asked to absorb this gratuitous tax so Apple can project a false sense of security. How’s life under a tin foil hat? How in the world is this remotely related to free software? It’s nothing more than a precautionary measure taken to protect n00bs from nuking their own system. 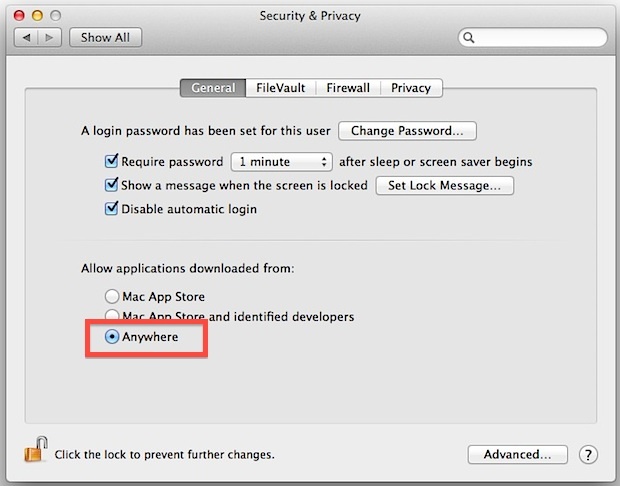 OS X in no way restricts the use of software developed for the system, it simply identifies software which does not have an Apple Developer ID. I fail to see your nearsighted perspective. William’s right. This new measure is another example of Apple taking away control from the computer over his machine. Everything on your machine is expected to pass through a single means – the App Store – which Apple has complete control over from both sides. If a developer wants to sell his software, he has to conform to company policy and give Apple a cut. Regarding open source, everything comes precompiled in the App Store and there’s very little opacity with regards to the source code. I find it EXTREMELY frustrating when you cannot install a program without opening your settings panel first. It’s my computer after all. In the last OSX, there was a warning that allowed me to agree to “Proceed with caution.” In Maverick, it’s disappeared. Is there a command line to do this? Its very simple Ctrl click is the same as right click so just right click and open and then it remembers it on that app forever so its not that much of a pain. Does anyone know how to reverse this procedure? Meaning: “I’d like to remove an app from Gatekeeper’s exception list”. System Policy Control. Check out “man spctl” You can add and remove individual apps, or globally enable/disable Gatekeeper also. Thanks John, really good advice to use System Policy Control. This allows to to keep the protection level high and easily apply fine-grained security control. effing brilliant… thank you. just needed to add a one-app exception. Thanks for this simple yet informative tutorial! I am a mac beginner and really need to know stuff like this. And just to let you know, this website was first on the list when searching for how to remove this security feature! Keep up the good work! You don’t see the point eh?… The point is, if you don’t know any better you get the apple safety net. If you do, then sure go disable it… thats your choice and one that isn’t hard and would only need to be done once, its not a huge deal so get over it. The truth is its not expensive to be an apple developer and it sure keeps a lot of the crap away from people that don’t know any better. I don’t want my mac to become a totally closed system like the iphone however I completely support protecting the noobs yet allowing freedom to other users, a sort of “advanced mode” if you will. FYI – Didn’t work for me with app LaunchpadCleaner in Mountain Lion 10.8.1. It installed without complaint, but wouldn’t let me run the program. So I deleted it from Applications and re-installed it the normal way (enabling any apps to be installed in the Security settings). Craig, thank you so much for this helpful information. You solved my problem! That’s what these forums are suppose to be about – helping people. There are so many needless insults flying around in this forum sullying it’s reputation. I almost left because I couldn’t find an answer to my problem, after trying several other things. But thank god I stuck around to see Craig’s response. Craig, thank you for rising above the noise with a no-drama solution. Technically speaking, this isn’t an “error”, it is an alert. Errors are the result of negligence by either the user or the developer, alerts (are meant to) provide important information regarding the app or system. Helped me out. Thanks a lot! I downloaded an app under Snow Leopard and created files with it. Now, even if I have turned Gatekeeper off, it still won’t let me open files created with that app without warning me and forcing me to click “Open.” Any suggestions for turning this off permanently? I stopped using Apple bc of nonsense just like this. Back to Linux on PC’s for me. Lot’s less sillyness to deal with. I just wanted to say THANK YOU for this helpful post!! I appreciate it. Thanks I got my solution completely and used desire software. thanks a lot! everything works as described.. Thanks Gerard, the spctl examples really helped. I now got a favorite app added to the approved ones. In Mavericks, even with my administrator account, I am unable to select “Anywhere.” I click the radio button, it blinks, but then forces the selection back to “Mac App Store and identified developers.” Any ideas? Thank you. Your suggestion worked perfectly. Thanks from me also. Trying to open an app for doing a chemistry demonstration for my students…you did it! THANK YOU SO MUCH I CAN’T EVEN. Thank you so much, such an easy and brilliant explanation. Would anyone know how to get to security and privacy if it’s been blocked? I need to do this to run 7zip, but blocks keep popping up. My files need to be recovered, and I can’t find any programs to do so. Thank you for the simple explanation! its now fixed. I worship the ground you walk on. Thank you so much. Thanks for the advice it really helped! I just got a 2nd hand Mac a couple of weeks ago (migrating from PC) and this was really annoying me. Solved now – Thanks a lot! I did this and various other methods, yet it still asks for administrators, which, to my great annoyance, have forgotten. Any idea why in finder it still asks for it? When I unlock the lock in the security and privacy area, it asks me for my password to unlock security and privacy. I dont have a password set up, I click unlock and it unlocks it for a half a second then relocks it back. How do i get it to unlock security and privacy arrows so I can download from anywhere? thanks! Gaaaaaaay. How is Microsoft not an “identified developer”??? Thanks nice guide. I tested it and it works with latest OSX El Capitan. my question is why don’t upwork make them identified? My Sierra OS (10.12.4) does not have the third option, “Anywhere”, under “Allow applications downloaded from:” Sierra only allows “Mac App Store”, with or without “identified developers”. Same with me! I have 10.12.5 and that option has been removed. I have this feeling though that somewhere deep in the system folder… there is still a way. Yes. Can’t find the “Anywhere” option. I wish they let the user decide what’s good for them. Stupid Apple. What truly ticks me off is not having to override “non” approved software but having to do it each time in Sierra. In previous OS versions, if I downloaded software once and gave the ok to get by the firewall, that was it. I could use the software any time I wanted thereafter without issues. Now each time I want to open Gimp I have to go through the same BS. I don’t have the “Anywhere” option! How far is this security and privacy and data protection bs still going to go? Can’t we just turn off the Internet altogether and go back to the fireplace? I mean, seriously, it’s all pretty f-d up!